Seems like an age since the last post. That’s the problem with having children, a million books on the go, and little free time! Social media takes a hit. 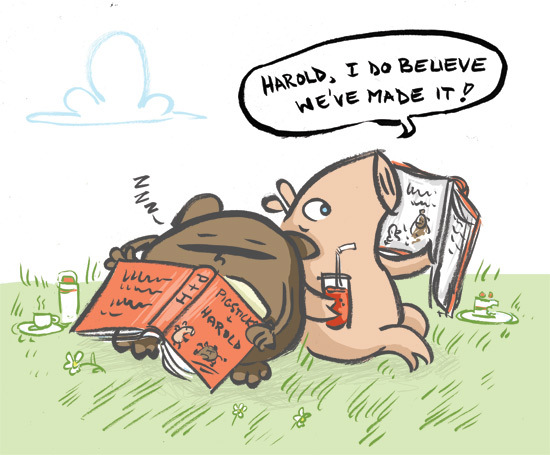 Still, Pigsticks & Harold continue to grow, and their books edge that little bit closer to publication. This is a snippet from the cover of book two, which is due late summertime, I think. This is their detective novel, very much in the vein of an Agatha Christie mystery. It was a hard battle to get it right, but I think we’re there, and the art work is the best it’s ever been. You can’t beat working solidly on characters over a period of years for sheer job satisfaction. I’ll post more about these two friends of mine nearer pub date of the first book, which is late May. Only four months to go! WOOHOO! 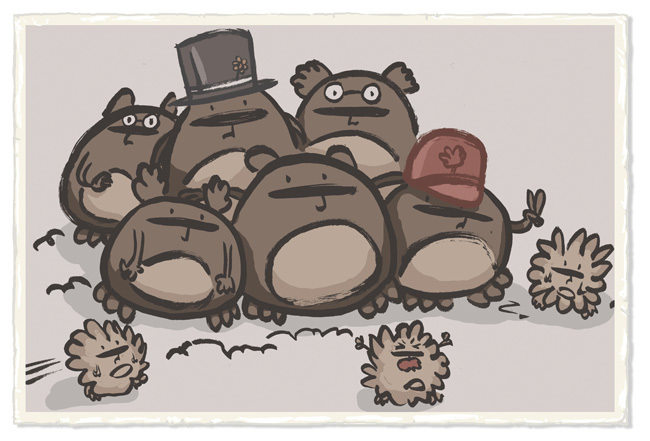 A little bit of news slipped out this week about a Pigsticks & Harold animated series being in development. It’s a massive thing, for sure, but it’s currently at the beginning of a very long journey if it’s ever to see the light of day. Jam media (who created the Tilly & Friends show based on Polly Dunbar’s books, among many other great shows) have already made some amazing animated scenes of the pair. Maybe one day I can post them for all to see. They look brilliant, and in a week’s time we’ll be pitching them and the show at the Cartoon Forum. So, fingers crossed. We’ve worked incredibly hard on this, and maybe one day my assuming pig and unassuming hamster will get their own TV show. So for now, here’s a picture I’ve done for the Cartoon Forum pitch of Harold and his Family. I love Harold. 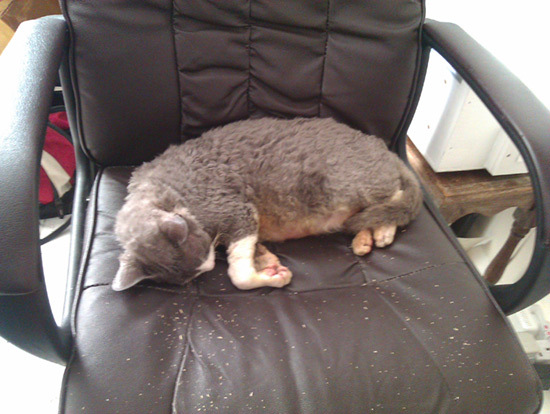 And a cat nicks your chair! Neil Gaiman in the Doors? I love the photos in Fortean Times of time travellers. There was this great one of a time traveller with a mobile phone in a Charlie Chaplin film. You get the idea. So there I was, doing some Youtube trawling, when I came across this video of the reformed Doors playing with Eddie Vedder in 1993, as they were inducted into the Rock & Roll Hall of Fame. And lo and behold, who is that playing bass? The time travelling Neil Gaiman, no less. I mean, he was alive then, but it’s definitely the Neil Gaiman of 2012. Quite amazing, but possibly not as amazing as Robbie Krieger’s leather trousers. 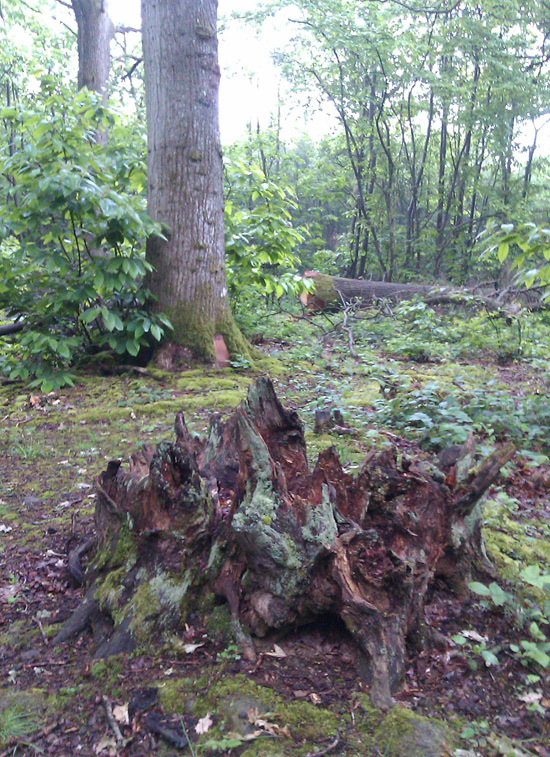 We spent a rainy weekend in our woods, de-brambling, tidying and making our log cabin livable. As much as camping is spoiled by rain, there is something magical about the sound of it falling onto trees. And you can’t beat the glisteningly moist conditions that shine at you when you first step out into the woods of a morning. 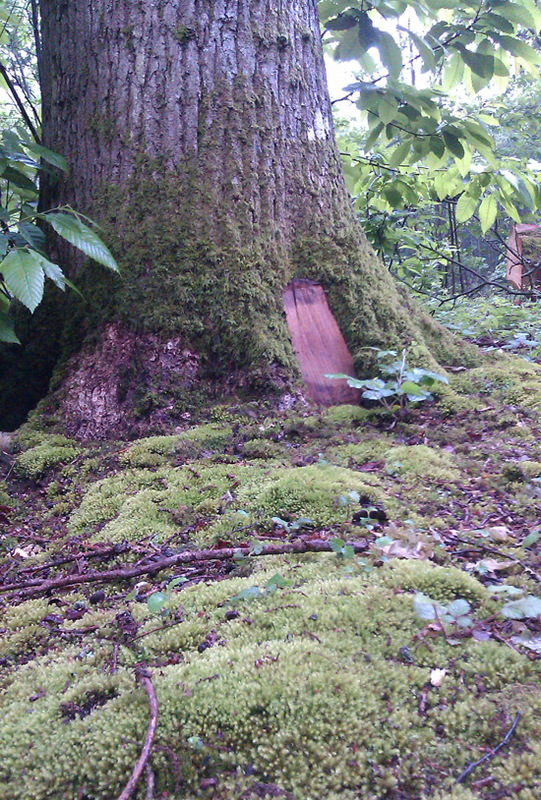 After seeing tiny pixie doors in trees at the Chelsea Flower Show (can’t remember which garden,) I thought placing some in the nooks of our many beautiful oaks would be a way of engaging my 2yr-old daughter. They need door knobs, and a few details, but you get the idea from these photos. In the few years that we’ve been managing our wood, and thinning the dense trees, we’ve really noticed a difference. This year we’ve got two new species of tiny wild flowers, and the moss and grass is now stretching out over the open ground. Wildlife is also on the increase, and we’re seeing far more birds and butterflies than ever before. This thing is a life’s work, a twenty-year plan at least, but seeing these little victories warms the cockles of your heart! Pigsticks and Harold get their own books! Yesterday I signed a four book contract with Walker Books for Pigsticks and Harold. I can’t tell you how excited I am about this. Pigsticks has been around for a good few years now (Harold not so long), but they are firm favourites of mine, both to write about and draw. Any long term readers of my blogs and tweets will have seen these chaps grow and evolve over the years, and very soon they’ll be stepping out into the world on their own. Gosh, they’ve all grown up!